RAIDMAX teases the Cobra, a "wide-bodied" mid-tower case with a green motherboard tray and green LED fans. The case measures 525mm x 240mm x 460mm (L x W x H) and has three 5.25" drive bays, three 3.5" HDD bays, four 2.5" SSD bays, seven expansion slots, and an I/O panel with one USB 3.0 port, one USB 2.0 port, and audio ports. The Cobra comes with the usual tool-free installation options and cut-outs for easy cable management and CPU cooler swapping. Cooling is provided by a 120mm front LED fan and a 120mm rear fan. In case you desire more airflow, it's possible to mount a 120mm fan in the bottom and one 180mm fan or two 120/140mm fans in the case's top. 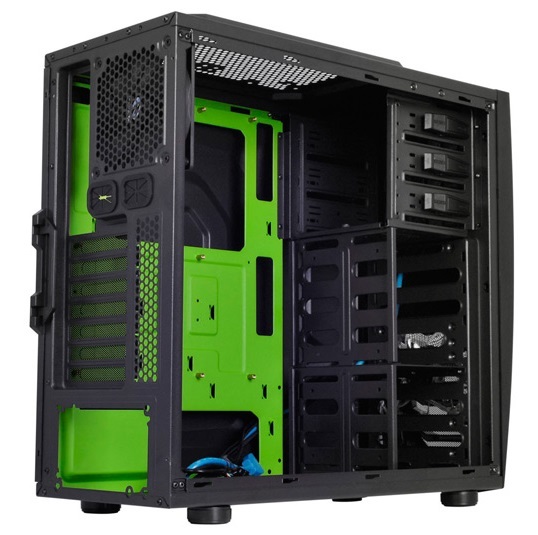 RAIDMAX is pleased to announce a mid tower chassis with a patented wide body design – COBRA. Designed with gamers' tastes in mind, this wide-bodied ATX and micro-ATX supporting chassis features LED lights, tool-less installations, and an effective thermal design. The 240mm (9.4”) wide COBRA has plenty of interior space to fit the hardware gamers desires, and many tool-less features to make installations easy. Up to three 3.5” and four 2.5” hard drives can be installed in the HDD cages. The 2.5” HDD cage can be removed. These hard drives just slide into the bay thanks to the COBRA's rail slide technology. The three 5.25” bays also have a tool-free design, allowing for simple optical drive installation. The smart one-click 5.25” bay covers on the front of the case come off with limited effort, and make it even easier to install optical drives. With its wide body, the COBRA can accommodate CPU coolers up to 6.9” tall, and has a roomy 25cm behind the motherboard tray for cable management. There are seven vented PCI slots and expansion cards up to 16.3” in length fit in the chassis when the 2.5” HDD cage is removed. 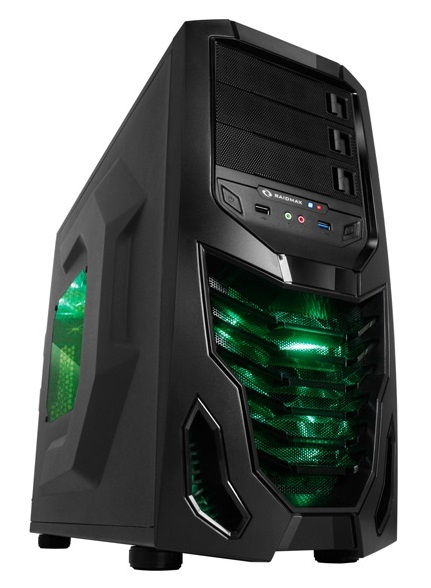 The front 120mm LED fan has a green glow, adding a gaming ambiance to the case and the room. The rear 120mm black exhaust fan blends in unobtrusively with the rest of the case. At the top of the RAIDMAX COBRA two 120mm fans or one 180mm fan can be placed adding more cooling ability. Also, another 120mm fan can be placed on the floor on the chassis. Underneath where the power supply sits is a PSU fan filter to help increase the life span of the power supply. The COBRA also supports water cooling with three rubber grommets in the rear of the chassis for water cooling tubes. The I/O panel with one USB 3.0, one USB 2.0 and audio ports is easily accessible on the front of the chassis. The power button and reset button sit on opposite sides of the I/O panel. The case will be available in North America in December for $69.99.